We have a comprehensive range of machinery to handle any type of project. Simply Siteworks is fast establishing a reputation on the North Shore as a company with a ‘can do’ attitude, reliability, and a high standard of workmanship. We are a leading provider of excavation services in Auckland and have a comprehensive range of machinery and expertise to handle, or assisting in, a wide range of work from residential, commercial and the construction sector. Our earth-moving teams are reliable and efficient, with a dedication to bringing every job in on time and on budget. Whether you're landscaping your backyard, need retaining walls built, laying the foundations for a major construction project, or your building plans require earth-moving, excavation or heavy concrete removal, we can help. Simply Siteworks can help with any type of earthmoving job. Whether large or small, we can help. We can handle a variety of concrete work from taking out old concrete that needs to be replaced, to newly laid concrete drives and paths. 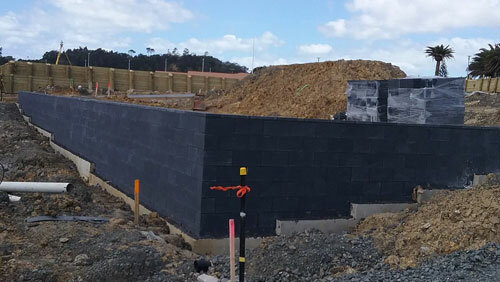 We can help shape your landscape, from land clearing to earthmoving and are experts in all sorts of retaining walls whether for small residential sites or large subdivisions. We have very competitive pricing and can supply to most of Auckland from the city up to Warkworth out west to the Waitakere’s. We are a team of friendly and approachable people who you will find it easy to deal with. We provide prompt responses and will keep you updated on how things are going. We will turn up when we say we will and aim to complete every job efficiently and on time, even cleaning up once we have finished. From trucks to diggers, compactors to rollers we have the right equipment to get the job done. And with over 40 years of experience between us, an in-house Quantity Surveyor and skilled staff to assist on site we have the right expertise to handle a variety of jobs. If you choose our fixed price quote, there will be no surprise with what you will pay. We will either provide a quote from a plan or come out to assess the site and provide a detailed quote. Alternatively we also offer charge up rates for clients that wish to be billed this way.